Dr. Morrell earned his undergraduate degree from Brown University in 1995. He then graduated from Tufts University School of Veterinary Medicine in 2000 before beginning a comparative pathology fellowship at The Johns Hopkins University School of Medicine. While at Hopkins Dr. Morrell concurrently completed a PhD in the laboratory of Dr. Charles Lowenstein in 2005 where he investigated molecular mechanisms of nitric oxide inhibition of platelet degranulation and received a K08 award. Dr. Morrell then established his own independent laboratory in the Department of Molecular and Comparative Pathobiology at Hopkins from 2005-2009, before moving to the University of Rochester's Aab Cardiovascular Research Institute. 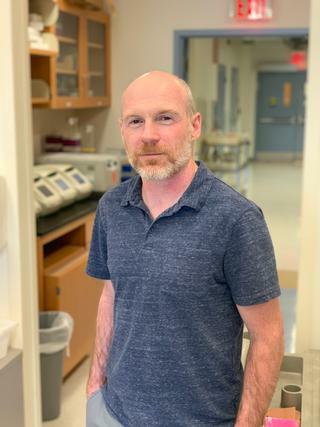 His current research interests include mechanisms of glutamate regulation of platelet activation and how platelets modulate and drive the immune response using transplant rejection and cerebral malaria models. Platelets have two major functions: hemostastis/thrombosis and an immune regulatory function. In our lab we actively study both important platelet functions. Pathways of Platelet Activation and Thrombosis: We have discovered that platelets express ionotropic glutamate receptors including the AMPA and KA receptors. When stimulated platelets release glutamate that can mediate membrane depolarization, increase GPCR signaling, and thus make platelet activation and thrombosis more efficient. We have also recently discovered that platelet glutamate receptor signaling drives COX activation and the elaboration of thromboxane, contributing to a pro-thrombotic and pro-inflammatory vascular environment. This work was published in JEM and Circulation Research. Based on these finding we have a R01 award to better defining glutamate mediated pathways of platelet activation. We are also in the initial stages of establishing a small clinical study to investigate the use of glutamate receptor antagonists as anti-thrombotic agents. Immune Regulatory Role of Platelets: Platelets have an important immune regulatory role that is not well defined. We have two main projects related to this key platelet function; the role of platelets in transplant rejection and the pathogenesis of cerebral malaria. We have established a skin transplant model to study platelet interactions with endothelial cells and leukocytes in transplant rejection. We have found that platelets accelerate vascular damage and leukocyte trafficking across transplant endothelium in response to alloantibody that was published in Circulation Research. This work is funded by a R01 award and is being expanded to more closely examine platelet interactions with T-cells and the role of platelet derived chemokines in transplant rejection. Our lab is also actively studying the role of platelets in cerebral malaria. Cerebral malaria is a complication of severe malaria, primarily in children, that has a vascular inflammation based pathogenesis. Using the mouse model we have established an important role for platelets and the platelet derived chemokine Platelet Factor 4 (PF4/CXCL4) in the development of experimental cerebral malaria. We are now dissecting the molecular signaling events between platelets and monocytes that promote the cerebral immune response. We are also exploring the role of platelets in stimulating the acute phase response very early in infection and how this may assist in clearing infected red blood cells. Modjeski KL, Levy SC, Ture SK, Field DJ, Shi G, Ko K, Zhu Q, Morrell CN. "Glutamate Receptor Interacting Protein 1 Regulates CD4(+) CTLA-4 Expression and Transplant Rejection." American journal of transplantation : official journal of the American Society of Transplantation and the American Society of Transplant Surgeons.. 2016 May 0; 16(5):1383-93. Epub 2016 Feb 25. Lannan KL, Refaai MA, Ture SK, Morrell CN, Blumberg N, Phipps RP, Spinelli SL. "Resveratrol preserves the function of human platelets stored for transfusion." British journal of haematology.. 2016 Mar 0; 172(5):794-806. Epub 2015 Dec 18. Batchu SN, Xia J, Ko KA, Doyley MM, Abe JI, Morrell CN, Korshunov VA. "Axl modulates immune activation of smooth muscle cells in vein graft remodeling." American journal of physiology. Heart and circulatory physiology.. 2015 Sep 15; 309(6):H1048-58. Epub 2015 Aug 14.